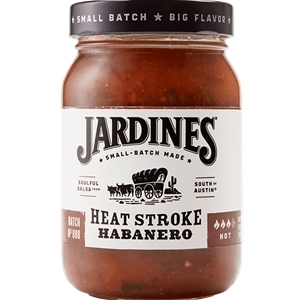 Jardine's Heat Stroke Habanero Salsa Hot delivers mouth-water flavor and delicious "makes your brow sweat" heat...just the way you like it! Made with premium habaneros, lots of veggies (tomatoes, onions, bell peppers, carrots) and a select blend of spices, this handcrafted recipe is all natural, fat free and DELICIOUS. Saddle up your taste buds...this salsa is ready to ride!